The Rigby Campfire - John Rigby & Co. 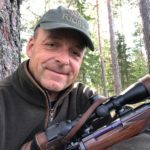 The Rigby Campfire blog is an opportunity for like-minded Ladies and Gentlemen of Adventure to share their stories of hunting, travel and tales of derring-do from around the world. No story, adventure or anecdote is better shared than around the campfire, gin and tonic in hand. Legends of ones that got away, near misses and memories from the field are the very things that bond us as an international community. Rigby welcomes you to its campfire to read stories from some of the worlds most seasoned and interesting hunters, explorers and adventurers.